The sorting of the Miscellaneous Boxes continues…. (The last section about Miscellaneous Box M will come in the next few weeks – I am just waiting for some information from a manuscript expert). 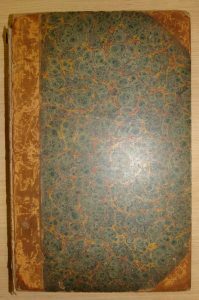 But in another box, I found this oversize bound journal belonging to Samuel Davis and donated by his son, John F. Davis, in 1830. Samuel Davis was born in the West Indies in 1760, his father being Commissary General there. He returned to England after his father’s death and then became a cadet in the East India Company, sailing aboard the Earl of Oxford to reach Madras in 1780. In 1783, Warren Hastings, then Governor of the Presidency of Fort William, assigned Davis as “Draftsman and Surveyor” on Samuel Turner’s forthcoming mission to Bhutan and Tibet. Unfortunately, the Tibetans were unsympathetic towards his “scientific” profession and he was forced to remain in Bhutan until Turner and the others returned. Whilst in Bhutan he turned his attention to recording the buildings and landscape of the country in a series of drawings. 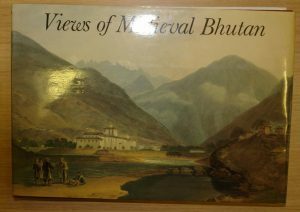 In 1982, Michael Aris published a book, Views of Medieval Bhutan, about Samuel Davis’ time in Bhutan, particularly concentrating on the many illustrations that Davis made of the country. However, the book also contains some extracts from Samuel Davis’s Journal. So I was keen to discover whether these were extracts of the Journal from the box that I was sorting. 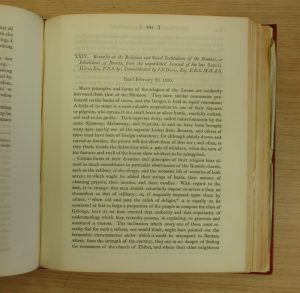 On finding the relevant page in Aris’ book, I read: “These extracts are based on those read to the Royal Asiatic Society on 20 February 1830 by the author’s son J.F. (later Sir John) Davis, and published by him under the title “Remarks on the Religions and Social Institutions of the Bouteas, or Inhabitants of Bhoutan, from the Unpublished Journal of the Late Samuel Davis, Esq. F.R.S. 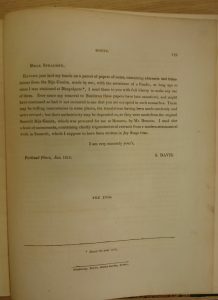 &c”, Transactions of the Royal Asiatic Society of Great Britain and Irelands, 11 (1830), p. 491-517.” And here is the first page of that very article. 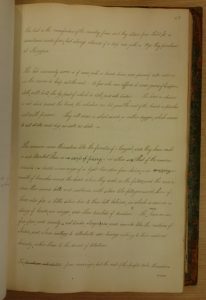 The Journal covers his actual journey through the country and his thoughts on its people and how England might relate to them and develop commerce. Davis’ career was just beginning when he went to Bhutan – a young man’s journey. On returning to India, he was appointed Assistant to the Collector of Bhagalpur, where he also met William Jones. They apparently became good friends joined by a love of mathematics. 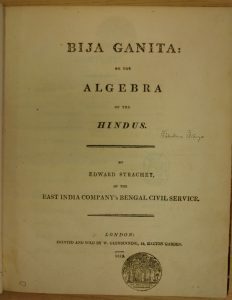 Davis’ mathematical knowledge is revealed by another book in our Collections: Bija Ganita: or the Algebra of the Hindus by Edward Strachey, published in 1813. 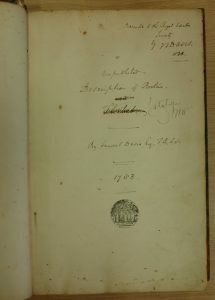 The copy in our Collections was donated by Henry Thomas Colebrooke in 1824. Though the book was written by Strachey, it contains considerable notes by Samuel Davis. In a copy of a letter at the end of the book, it is revealed that Davis had first made a translation of the Bija Ganita, with the help of a pandit, when stationed at Bhagulpur. Davis had sent his notes to Strachey who had studied and used them to help in his own translation. Davis continued to move through the ranks of the East India Company becoming a Collector at Burdwan and then a magistrate at Benares. He also held the positions of Superintendent-General of Police and Justice of the Peace at Calcutta, and a member of the Board of Revenue and Accountant-General of India. He resigned from the civil service in February 1806 and returned to England via St Helena, where he undertook more paintings. He was elected a Director of the East India Company in October 1806 and remained in post until his death in 1819. Davis was certainly a man of his time – immersed in the East India culture, and his son, John Francis, followed in his footsteps, eventually becoming the second governor of Hong Kong. Maybe this Journal will give us the opportunity to discover more about the man and his view of the world in which he found himself. The RAS Lecture Series for 2017-2018 will begin on Thursday October 12th at 6.30 p.m., when Russell Harris of the Institute of Ismaili Studies will take us on another journey as he lectures on “A Journal of Three Months’ Walk in Persia in 1884 by Captain John Compton Pyne”. All are welcome to attend this first lecture of our forthcoming season.